Debbiedoo's: Magazine copy cat challenge #2! I have had several inquiries as to when I am going to do another Magazine copy cat challenge. So I thought why not? It was a lot of fun, and some even told me it was their favorite party. Told you my first love was and always will be spray paint! This is a really pretty color, and I must find something else to paint! I lightly distressed the frame too. I thought it was pretty cute and easy, not to mention cheap. I picked up the frame from Walmart for $3.00 and some cork mats. I have so many pairs of earrings, and they do make cute accessories for the dresser too. What are the guidelines to this party? YOU MAY copy anything your heart desires from a magazine. Put your own spin on it. It does not have to be exact! However, you must take a picture of your inspiration to go along with the challenge. SEPTEMBER 14th, mark you calendars! Woo-Hoo... I've already got mine picked out. I've been saving it up. I can't wait to get started. Oh, it's 9pm, guess I'll have to wait till the morn. YOU, BE THE BEST for doing this again and giving us all something fun to think about, work on and post about. this is such agreat idea, I can't wait to see what you do, Maybe I'll even give it a go! YAY....I AM EXCITED. This was one of the funnest memes, ever. Thanks so much for having #2. It is going to be so fun. I watched this from the windows last time and thought it looked so fun! I will be looking for my inspiration picture. You copy catted perfectly, Debbie! Have fun with your next party. Looks like fun! I have to get something going! Sounds like fun ~ you did a great job ~ cute earrings! Sounds fun! I need to find something to copy. That is super cute!!! I might have to make one of those for Reagan similar to hold her hairbows. I've only got two pairs of earrings I wear, my big diamonds hubby bought for christmas a few years ago and pearl earrings he bought for my birthday last year. I've got tons of magazines...I hope I'll have time to set something up. My hubby should be deployed by then. Consider me in for the Magazine copy cat! Sounds like fun and I already have something in mind! Love that new krylon color and will be using it.. I'm loving everything about this! The color is perfect! I have to say that enjoy looking at this series so much Debbie! It's such an inspiring idea to do a project. I missed the challenge before, but will definitely make a note to get busy for this one! That will be fun to watch. Looking forward to it. Great and useful project this one is! Great idea! Love what you did with your frame. THat is a great color. I am so going to try this! Finally found something to copy, I didn't make your last party but I will this time! Thanks Deb! Forgot to say that I love the earring frame, I have a lot too, I'm going to Walmart and GW today, maybe I'll find a frame! I already have my copy cat idea and have pictures of it. Just have to get the post ready. Looking forward to this party! Maybe this copycat challenge will pull me out of the lazy streak...I so enjoyed the last one. Love this idea for displaying your favorite accessories..ear bling blang. 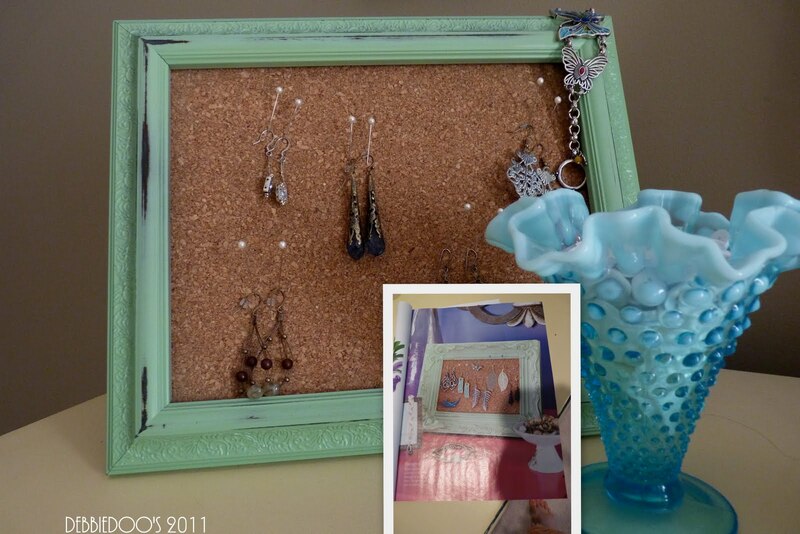 Your jewelry cork board is fantastic! I think I should make one for my daughter's room. I loved looking at the links from your last copy cat challenge, Debbie, so I can't wait to check out your next one. Oh goody. I'm in. Love the frame and love that color!! I guess I'm going to have to sit on my side porch with some magazines. Oh, darn! Count me in! This is an awesome idea as usual! Hey last night I was on here and it was blac and I couldn't comment and then this morning back to normal..what's up with that? Crazy but fixed, these darn computers or maybe it's the *operator*...I'll get into this 21 century sooner or later! This is such a cute way to "SEE" your jewelry and earring collection! Maybe if I had mine on a board I might remember to wear it! I like this color. I haven't seen it yet. Our Walmart which is the closest store that carries Krylon carries so little colors it makes me frustrated. Your earring frames turned out really nice. I'm going to have to think about this one, you know what happened last time I tried to duplicate a mag. haha! Maybe I'll try something a little less ambitious this time. This is great fun...I will try to come up with something. Thanks for coming to the Open House party!